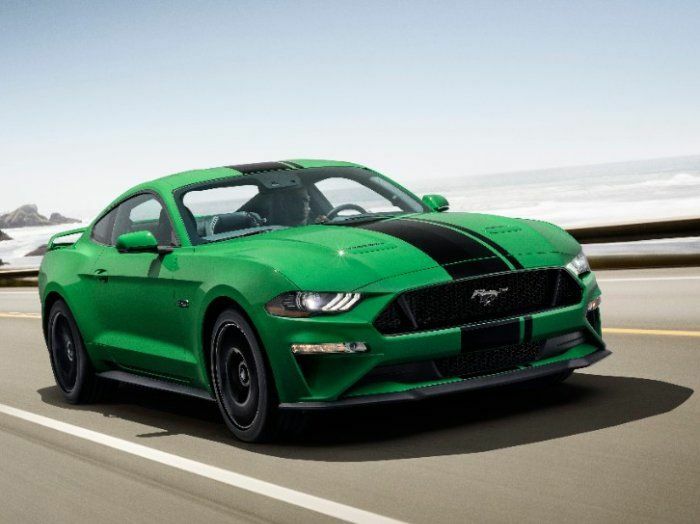 For those folks who don’t fancy green beer on St Patrick’s Day, Ford Motor Company rolled out a sportier way to celebrate the luck o’ the Irish with the introduction of the new Need for Green 2019 Ford Mustang. Last week, I attended a Ford media function where we heard and saw all sorts of cool things that we aren’t allowed to talk about and at the time, one of those things was the 2019 Ford Mustang in a gorgeous new green exterior paint. The green muscle car was sitting outside next to a new GT350 and a GT supercar, so it went unnoticed by many people. We would later learn via press release that this was our first look at the Mustang’s new “Need for Green”. The 2019 Ford Mustang will come in the lovely shade of green shown above, playfully named Need for Green. This color is not as light as Gotta Have It Green from the likes of the 2013-2014 Boss 302, but it is considerably brighter and more noticeable than Guard, which was the green offered on the Mustang. In many lighting conditions, Guard looked more grey than green, but in bright sunlight, it was distinctly a dark metallic green. Guard wasn’t offered for 2017 or 2018 and a bright green hasn’t been offered since 2014, so with the arrival of Need for Green in 2019 – the Ford Mustang gets its first proper green in five years. The 2019 Ford Mustang in Need for Green will be available this summer and while it isn’t likely to unseat the most popular colors, I think that it is going to sell well. The pictures here don’t do the new color justice, as it really looks great on the 2019 Mustang GT in the bright sunlight. There is no mention of a price increase for Need for Green, so it might be a no-charge color, but it seems more likely that the Motor Company will charge extra for this bright color. Right now, the 2018 Mustang is available (on Ford.com) in 11 color and 4 of them come with a price increase. Ruby Red and Royal Crimson are both $395 while Triple Yellow and Orange Fury are $495. Need for Green seems to fit in with the yellow and orange options, but even with a $500 upcharge – it is an awesome addition to the palate of the 2019 Mustang. So, should everyone should have black, red or white white in your utopian world? My 1999 GT is this color and when I go car shows it gets lots of attention particularly from young guys and gals. Everywhere I go people in parking lots and at gas pumps have told me how sweet the car is and how awesome the color is for 19 years and going strong. Just the other day a drop dead gorgeous young woman half my age stopped to tell me how awesome my car was and how much she loved the color. I could be wrong but that looks like Electric Green to me. If it is I hope they keep its proper name instead of rebranding it with some gimmick nonsense name. An electric green Mustang is desperately needed and I have been waiting for them to make it again so I can park it next to my 1999 GT. Everywhere I go in this car I still get compliments 19 years later on the electric green paint job. The young guys under 30 at all the car shows positively love it.